At the beginning of June 2016 I took some friends on a couple of walks from my book, Circular Walks On The Tuscany Umbria Border (available for download from Amazon). The Rocca di Pierle Walk starts in the hamlet of Pierle which is built around an old castle, the Rocca di Pierle. The route climbs steeply up tracks through thickly wooded hillside, partially following an old Roman road. Once you emerge on the ridge at the top there are splendid views to either side. 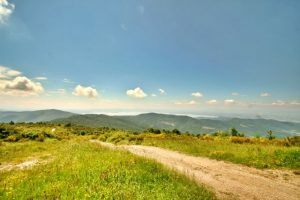 As you climb along the ridge to the highest point, Monte Ginezzo, there are views in every direction and you can see a large part of Lake Trasimeno, particularly if you climb the wooden tower use as a fire look out point in the dry summer months. The route descends through more chestnut and oak forest and returns to Pierle along a gravel track. It takes about 3 hours and is a tough walk so don’t attempt it if you are very unfit!